Of particular interest to the FBI agent was how the animal rights movement has responded to the government’s use of informants. I have reported here previously about the FBI infiltrating vegan potlucks, and much more serious cases involving an informant named “Anna,” Brandon Darby, and Jacob Ferguson, among others. A common term in activist circles is “security culture,” which means being aware of government surveillance and taking reasonable steps to protect your privacy, and the privacy of others. One aspect of security culture, for instance, includes email encryption via PGP. Activists who have had homes raided by the FBI or been harassed through grand jury witch hunts have learned the importance of protecting their privacy, and making it less easy for the FBI to snoop into their political activity. “Security culture” has been cited in court cases and Congressional hearings as a source of frustration for FBI agents. This FBI document was provided to me by Ryan Shapiro, who is a PhD candidate at MIT. Shapiro, a historian of science, is researching conflicts over animal experimentation and national security. This document surfaced in one of his Freedom of Information Act requests. Throughout U.S. history, there have been government campaigns against progressive social movements. This document reveals a continuation of that trend, not only in terms of the ideological motivations, but in terms of the specific tactics used by law enforcement. One of the most notorious eras of FBI spying in recent memory was dubbed COINTELPRO. According to FBI Director J. Edgar Hoover, COINTELPRO aimed to “expose, disrupt, misdirect, discredit, or otherwise neutralize” radical social movements in the 1960s, using any means at their disposal. 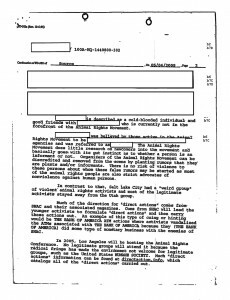 The tactics discussed in this document, including the details about spying, informants, and rumor-spreading, are direct parallels to those used in COINTELPRO. The Church Committee hearings in the 1970s ostensibly put an end to those operations, reining in rogue police operations. This is yet another example of how the COINTELPRO legacy has been institutionalized, and continues to endure. To anyone familiar with the animal rights movement (such as the informant), the thought of this is quite odd. Animal activists have not robbed banks. They have not taken up arms. Judging by the structure of the document, though, and the accompanying material, it is clear that these transcribed comments were the informant’s response to direct questions by the FBI agent. In other words, the FBI agent was seriously questioning the informant about the feasibility of animal rights activists and “eco-terrorists” building a true guerilla-style revolutionary movement. In many ways, this is the most revealing segment of the entire file. The animal rights movement has never injured a single human being in the name of protecting animals, let alone in the name of money. For the FBI to entertain the possibility, and press an informant for further information, is another reflection of how much the bureau has lost touch with reality. As I have discussed on this website at length, the creation of animal rights and environmental activists as the “number one domestic terrorism threat” has been a coordinated campaign by corporations and the politicians who represent them. As we see here, the rhetoric has taken on a life of its own; even the most far-fetched ploys are discussed straight-faced, business as usual, and the scare-mongering has been institutionalized into national security operations.